Supposedly they only use virgin hens here for better flavor and they're probably more tender as they would be younger. The flavors of the fried chicken are amazing, from the spices used down to the succulent meat. Sucking the last bits of meat from the bone was the best part. This is not the bland, mass-farmed fat chickens you find in the US. 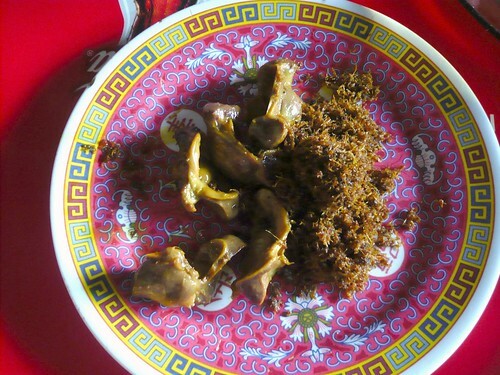 This is the lean yet tender, almost-gamey meat of a chicken that roamed the streets of Indonesia. 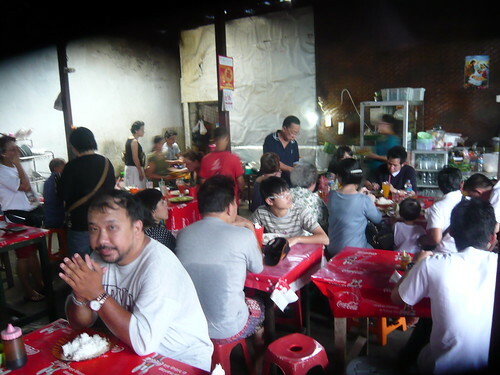 Warung Doyong is a long-standing family-run institution in Bogor, doing very brisk business in the last 30 years. According to one Indonesian blog post, they go through 30 chickens on a weekday and 100 on Saturday and Sunday. The fact that they still haven't progressed beyond purchasing fans in the last 30 years didn't stop anyone from coming. So what if you have to sit on a wobbly plastic stool and your shirt sticks to your back? 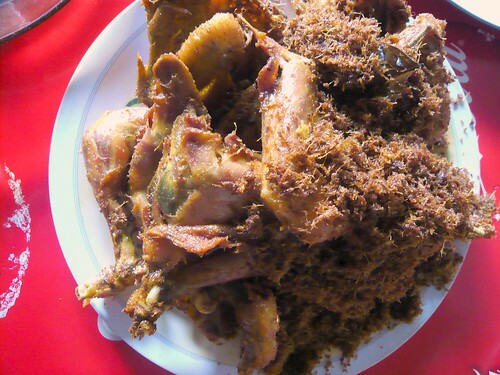 You'll be sweating as you dive into your fried chicken doused in sambal anyway. Rice and cucumber slices accompany your chicken, but don't forget to get your share of offals. The gizzards (ampela) have always been my favorite. Warung Doyong opens at 7 am and closes at 5pm but if you go too late in the day, you may only find scraps and leftovers. The locals come here because it's cheap at less than $1 apiece (they have other dishes that run about $1.50); the out-of-towners like us come because it's just damn good. you're killing me Fiona!!! :( did you get to eat here again in your last visit? Hehe no I didn't, but I think this year I will since I'll be in Jakarta again!